Guerrilla farming refers to growing cannbais away from your own property, or in a remote location of your property where people seldom roam around. or simply growing cannabis ( marijuana ) in the wild. It is possible to find locations that for one reason or another are not easily accessible or are privately owned. Try to grow your cannabis off your property, on adjacent property, so that if your plot is found, it will not be traceable back to you. If it is not on your property, nobody has witnessed you there, and there is no physical evidence of your presence (footprints, fingerprints, trails, hair, etc. ), then it is virtually impossible to prosecute you for it, even if the cops think they know who it belongs to. Never admit to growing cannabis, to anyone. Your best defence is that your just passing thru the area, and noticed something you decided to take a look at, or carry a fishing pole or binoculars and claim fishing or bird watching. Never tell anyone but a partner where the plants are located. Do not bring visitors to see them, unless it is harvest time, and the cannabis plants will be pulled the same or following day. Make sure your cannabis plants are out of sight. Take a different route to get to them if they are not in a secure part of your property, and cover the trail to make it look as if there is no trail. Make cut backs in the trail, so that people on the main trail will tend to miss the cut-back to the grow area. Don not park on the main road, always find a place to park that will not arouse suspicion by people that pass on the road. Have a safe house in the area if you are not planting close to home. Always have a good reason for being in the area and have the necessary items to make your claim believable. 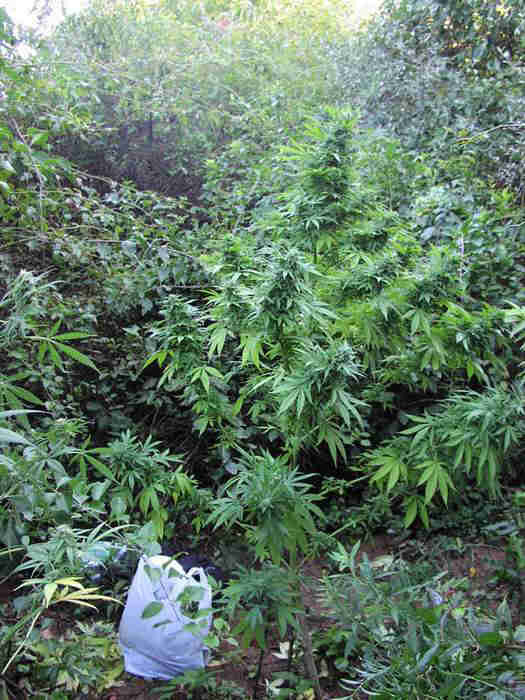 Try to plant your cannabis plants under trees, next to bushes and keep only a few plants in any one spot. Train or top the plants to grow sideways, or do something to prevent the classic christmas tree look of most plants left to grow untrained. Tying the top down to the ground will make the plants branches grow up toward the sun, and increase yield, given a long enough growing season. Cannabis Plants can be grown under trees if the sun comes in at an angle and lights the area for several hours every day. Cannabis ( marijuana) Plants should get at least 5 hours of direct sun every day, and 5 more hours of indirect light. Use shoes that you can dispose of later and cover your foot prints. Use surgical gloves and leave no fingerprints on pots and other items that might ID you to the fuzz...in case your plot is discovered by passers by. Put up a fence, or the chipmonks, squirles and deer will nibble on your babies until there is nothing left. Green wire mesh and nylon chicken fencing net work great and can be wrapped around trees to create a strong barrier. Always check it and repair every visit you make to the garden. A barrier of fishing line, one at 18" and another at 3 feet will keep most deer away from your crop. Gopher Granola is available for areas such as the N. CA mountains, where wood rats and gophers will eat your crop if given any opportunity to do so. The best fence in the world will not keep rats away from your plants! Do not use soap to keep dear away, it will attract rats! (The fat in the soap is edible for them.) Put the poison grain in a feeder than only small rodents can enter, so that birds and deer can not eat it. Set out poison early, before actual planting. The rats must eat the grain for several days before it will have any effect on them. Ultimately, you may find it is easier to grow in a greenhouse shed in your own backyard rather than try to keep the rats from eating your outdoor plot. When growing Cannbais in a guerrilla fashion away from the house, in the wild, water is the biggest determining factor, after security. The amount you can grow is directly proportional to the water available. If you must pack-in water, carry it in a backpack in case your seen in-route to your garden; you will appear to be merely a hiker, not a grower.